Soluble in aqueous solution (5% AcOH) (1mg/ml). Determined by MS and EA. Glucagon-like peptide-1 (GLP-1) receptor agonist. Antidiabetic agent against type 2 diabetes (T2D). Stimulates insulin and suppresses glucagon secretion in a glucose-dependent manner. Longer-acting alternative to liraglutide. 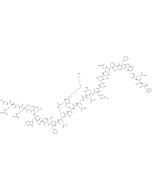 Chemically similar to glucagon-like peptide-1 (GLP-1), with two amino acid substitutions compared to human GLP-1 (Aib(8), Arg(34)) and derivatized at lysine 26. Antiobesity activity. Reduces energy intake, likely mechanisms for semaglutide-induced weight loss include less appetite and food cravings, better control of eating and lower relative preference for fatty, energy-dense foods.